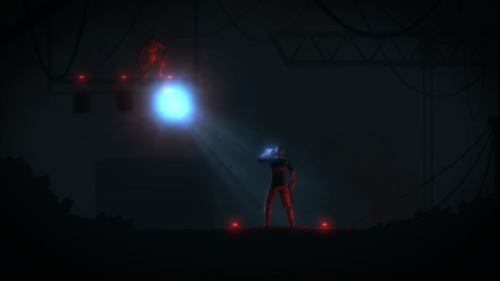 The Fall, available now on Steam, hails from that hotbed of current gaming releases from Canada and is developer Over the Moon’s first title to be released since the company began in January 2013. Their mission statement is to create games that have atmosphere, are creative and have an engaging narrative and in this their first release they have definitely lived up to their promise. This project was conceived via the Kickstarter program and when the program had finished it had received more than double its projected goal ($38,155 when the target about $17,000) . . . . not bad! In fact it’s OUTSTANDING! 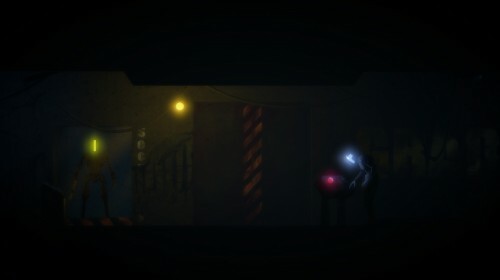 This is a 2-D sci-fi side-scrolling game with point and click & action adventure sections. It comes across as a mixture between Metroid and Flashback, which are 2 fantastic games, so they can’t go wrong really. You play as ARID, an AI programme controlling a super suit that’s main mission is to protect the human that is inside it, as the human has fallen unconscious, probably due to the hefty fall from space that you see him taking at the beginning of the game. The puzzles are very much your point and click / action adventure part of the game, in terms of listening to some dialogue, do something, pick a part up and finding where the hell is meant to be placed, reminds me of games like Broken Sword, where sometimes you got to think outside of the box. It can be at times frustrating as you think something will work, but it doesn’t, so you have to either think about it more or guess and use every item in your inventory, if that fails then you know that there’s some more exploring to do in your near future, welcome to games of the past people! You interact with everything through your flashlight, you aim at an object with the mouse, if a magnifying glass appears, if you stare at the object long enough some text will appear, you then press ‘left shift’ to physically interact with it and then left or right to select what you want to do, this after a while though starts to hurt your hand, so maybe re-bind the key to ‘Q’ or something before playing, will save a lot of pain. When you finally get a weapon to defend yourself, you are briefly told how to use it and how to go into cover, using the 2D backgrounds and turning them into 3D by using the pillars or columns as cover to hide behind. First rule of shooting games, where do you aim for. .. that’s right, the head, and this is no exception here. Watch the robots pattern, see when the best opportunity is to strike and go for it, if you do get hit, don’t worry your shield / health will regenerate over time. 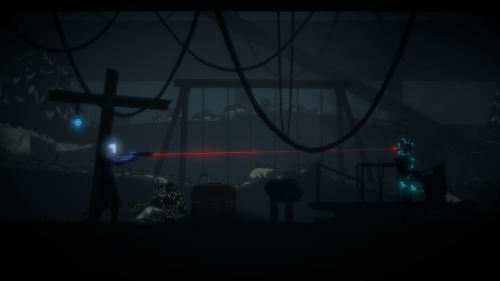 Whilst playing the game an atmosphere is created brilliantly with the eerie music, darkness and only your torch to kind of show you the way, gave me a cold shiver and goose-bumps at times in anticipation of what is going to happen. That’s how good the game gets, you have no idea what is going to happen next. Will a robot appear and shoot you? Will there be absolutely nothing? The game keeps you guessing and waiting. This is the first part of a trilogy, so with 2 more episode yet to come, it will be interesting to see where they next take the adventure. Also with a Wii U version in the pipeline and as the only current generation console muted for a release, how will they make use of the Wii U Tablet? The games looks beautiful, plays very well and has enough for you to keep going for 3 – 4 hours, probably more as you will need to rest your brain every 30 – 45 minutes, or maybe that’s just me. Overall, The Fall is a very well done game which you will want to recommend to your friends. The potential to be a very good trilogy, a shame it won’t appear as a downloadable title on the other consoles as I feel it would do really well on them. Perhaps this is an avenue they can explore when all 3 episodes are released. This entry was posted in Uncategorized and tagged Broken Sword, Flashback, Metroid, Over The Moon, PC, Steam, The Fall, Video Games, Wii U. Bookmark the permalink.